The title of this post has the word bacon in it. Only good things can happen moving forward from here. Roasting things makes them taste good. Putting bacon on just about anything is going to be a win. So, I gave it a shot, and even with a few hiccups, it was pretty awesome. 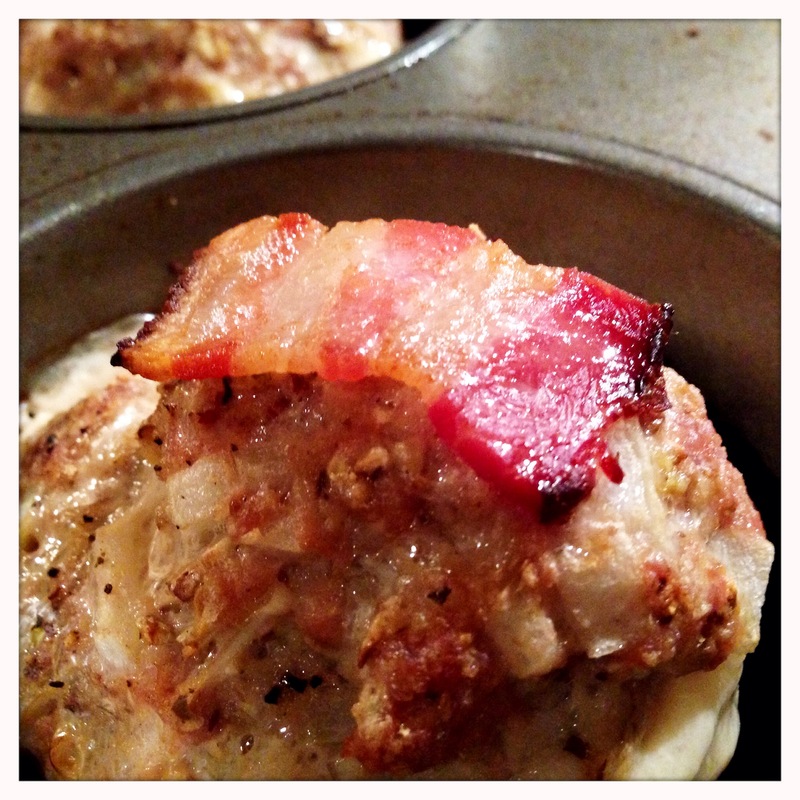 I served the parsnips with a basic turkey meatloaf muffin, which I also topped with a small piece of bacon since there were a few pieces left after wrapping the parsnips and, well, see #3 above. 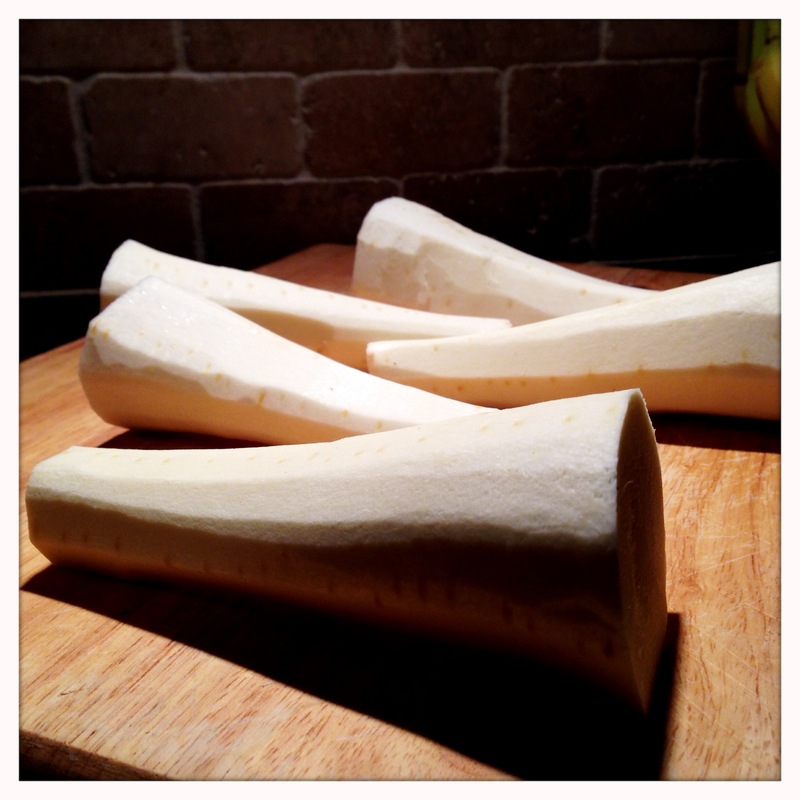 …but the focus of this post will be the parsnips. So…let’s get bacon. I mean let’s get started. With bacon. Set a pot of water to boil on the stove and preheat your oven to 400 degrees while you peel the parsnips. Once the water is boiling, salt the water and be sure the salt dissolves. The salt is going to help infuse a little flavor into the parsnips before wrapping and roasting. 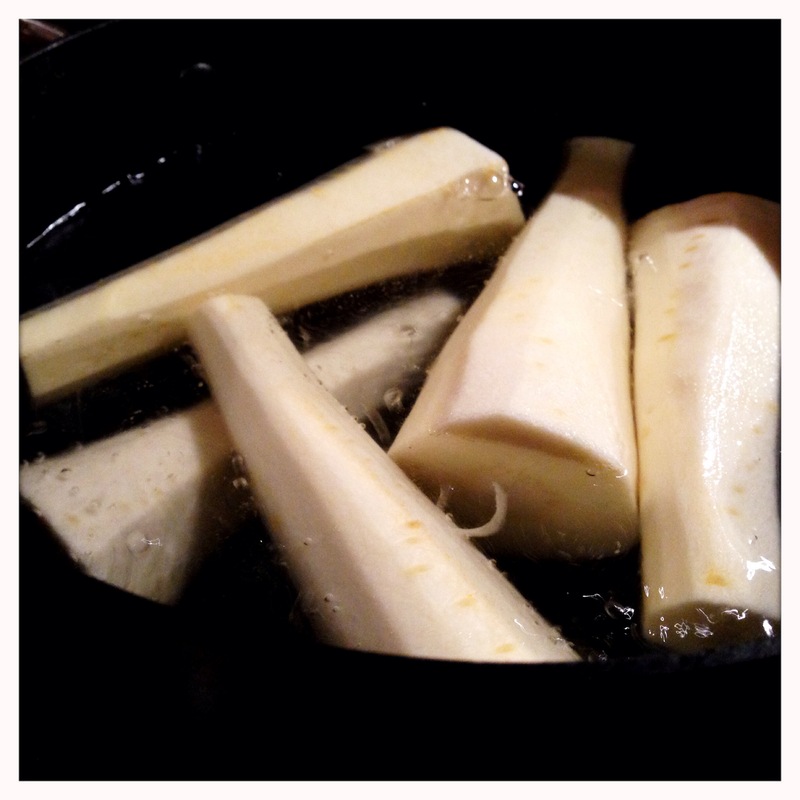 Place the peeled parsnips in the pot and let them boil for 3-4 minutes. Carefully remove the parsnips from the water and set them on a cutting board to cool a bit so they can be handled. 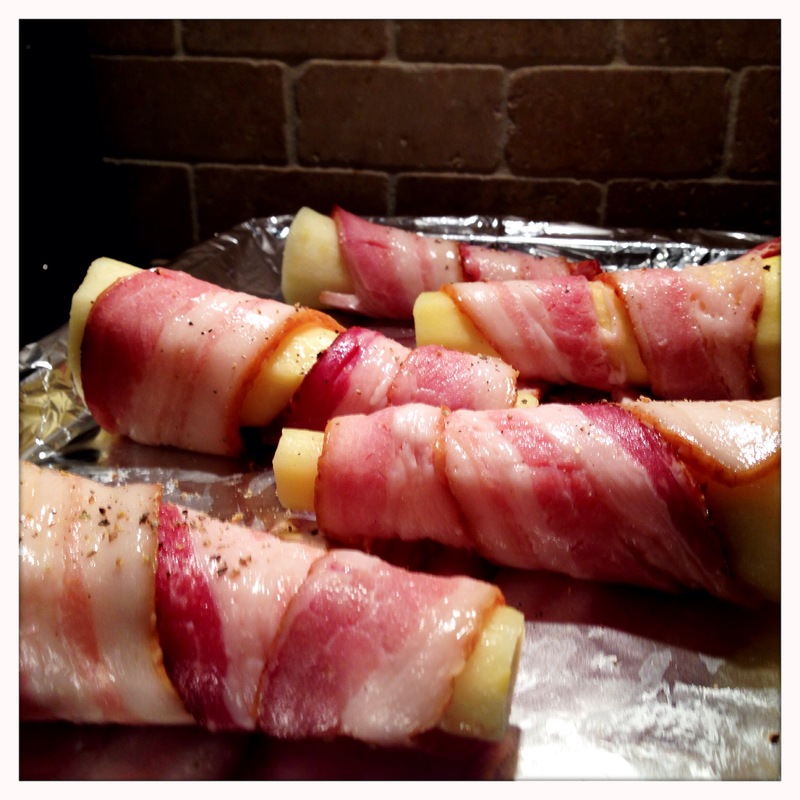 Wrap them tightly with the bacon, and arrange them on a foil lined baking sheet. Combine all of the ingredients in a large mixing bowl, and work everything together with your hands. Divide into even sized balls equal to the number of cups in your muffin pan. Place a drizzle of olive oil into each cup of the muffin tin and spread to evenly coat the cup. 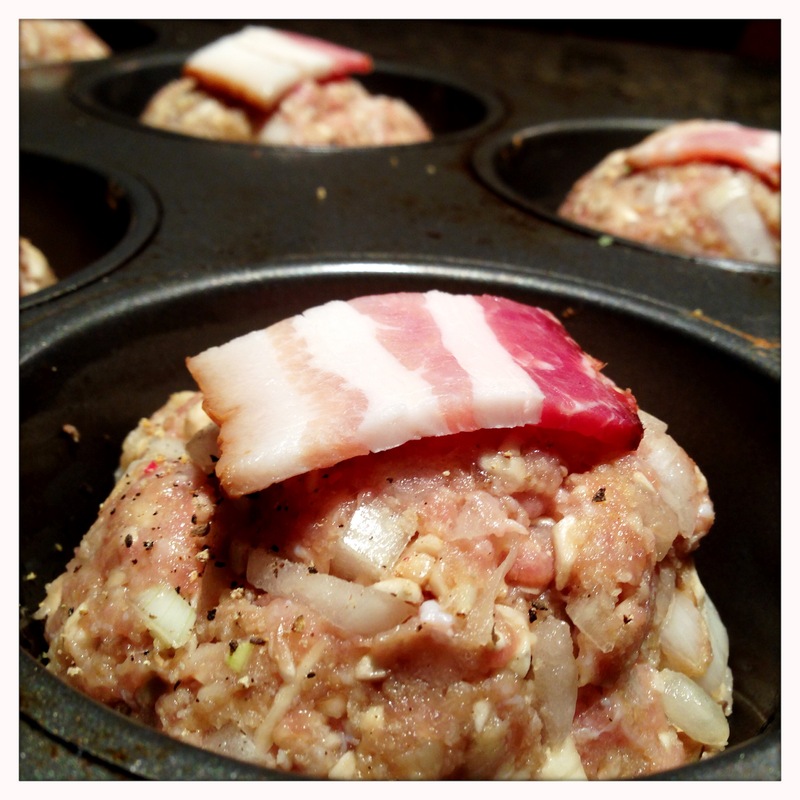 Place a meatloaf ball into each cup. 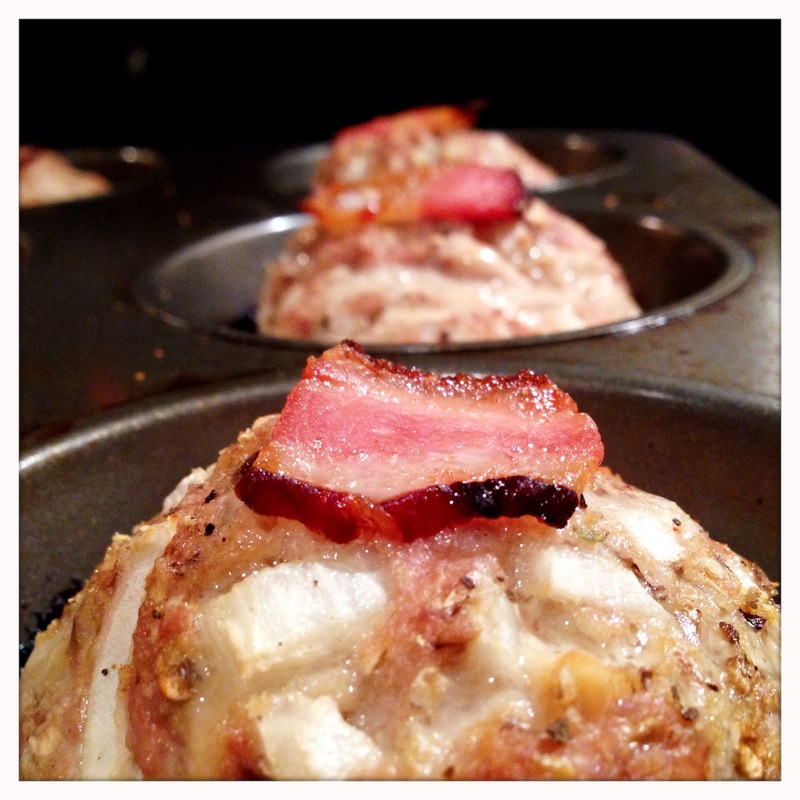 Place a small piece of bacon on top of each ball, and place the muffin tin in the oven. Bake the muffins for about 30 minutes, and you will be rewarded with a tasty meatloaf muffin with a perfectly crisped bacon nugget on top. Okay, back to the parsnips, they’ve been turned, the kitchen is starting to smell like bacon and it’s time to pull them out of the oven. Be careful when handling the baking sheet as there will be a fair amount of scorching hot bacon grease rolling around. This can certainly be saved and used in a soup stock or any of a number of other uses (Googling “uses for bacon grease” will give you no shortage of ideas). 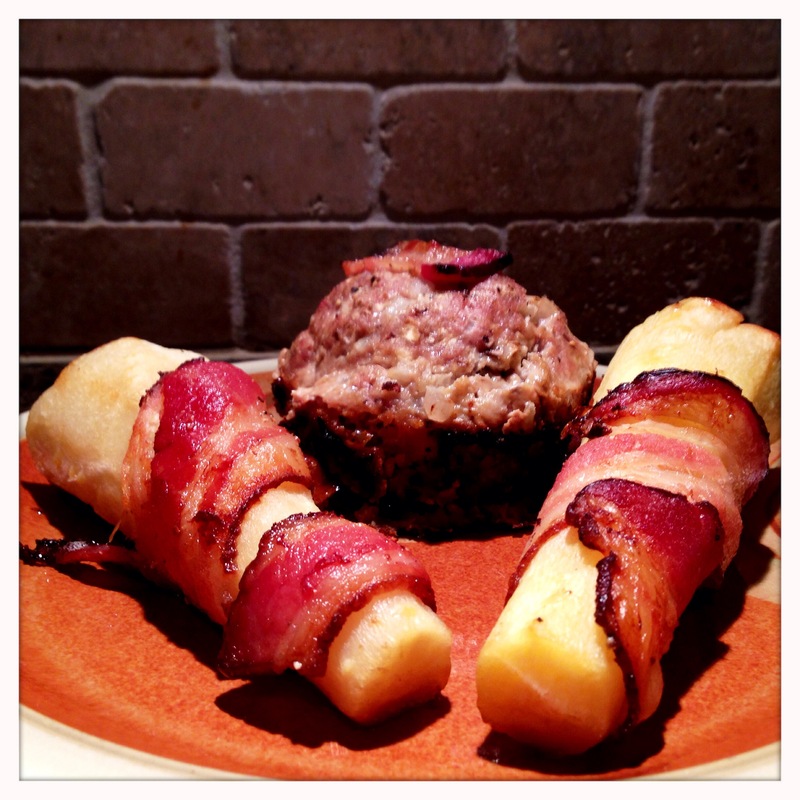 Plate two parsnips with a meatloaf muffin, and you have a delicious treat that everyone will enjoy. As has been mentioned before, this isn’t by any means a “health food” blog. I do think that just about everything can be consumed in moderation. 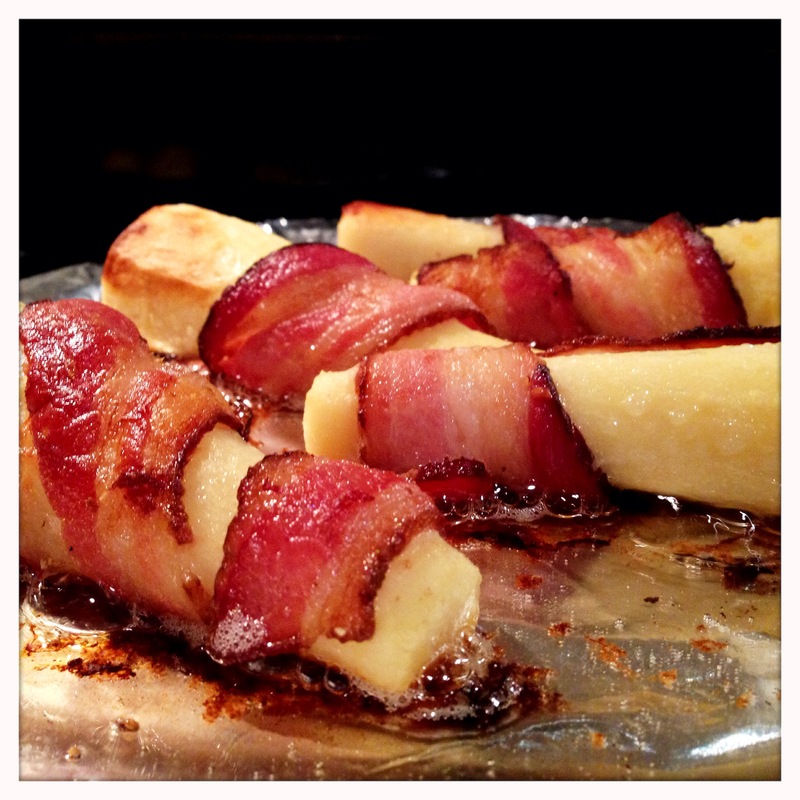 Bacon is consumed rarely in our house, but I like to make the most of it when we do eat it. Much like the brussels sprouts that pop up on this blog frequently, I think the parsnip is a misunderstood and highly underused vegetable, but this recipe is a simple way to add the delicious and unique flavor of parsnip to your veggie arsenal. Enjoy! They’re pretty tasty. I’m still working on the right timing for the boiling and the roasting, but it’s a nice, pretty quick recipe. Thanks for the comment – I found your blog googling the Floriana Gruner Veltliner from Trader Joes as I just picked up some of it for Christmas to serve with some cornish hens. Really enjoyed it – will have to read some more of your posts! Thanks, Jason, for your kind words. 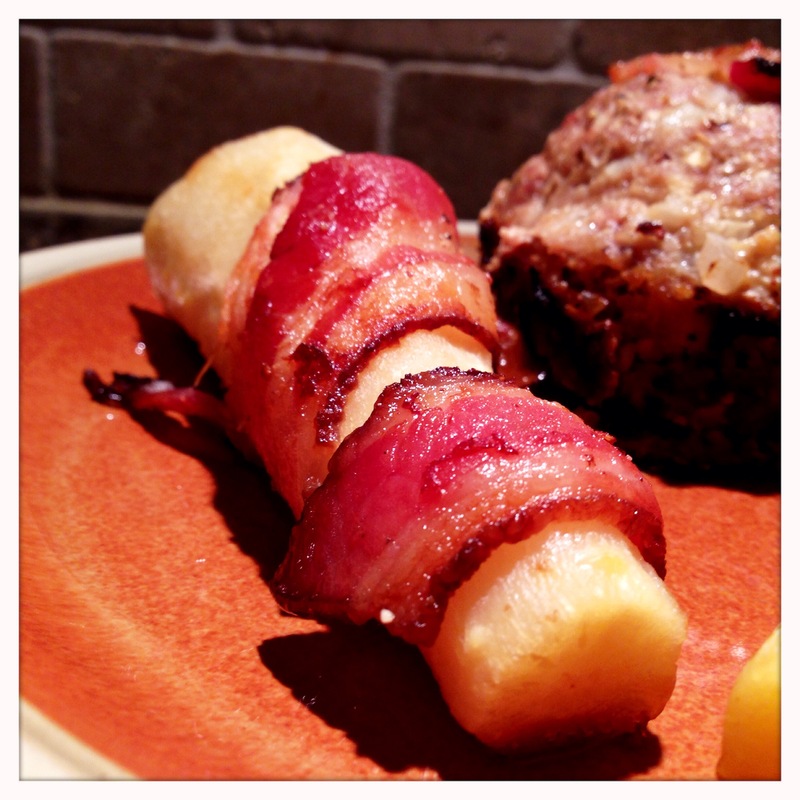 I am following your blog now, looks like a lot of great recipes! I enjoyed the Floriana for what it is, a good food wine, and I can totally see it work with chicken as well. Have a great holiday season! !